You are in: Home > Places > Rev. Samuel Barber, Shelton Church, Nottinghamshire, The Antiquary, 26 (1892), 14-16. A VAST collection of villages, which would in most parts of England be considered only hamlets, lie to the west and south-west of Newark. Many of these are of such small population, and characterized by so great a uniformity of rural life, that, to the citizen or inhabitant of a populous district, they seem wrapped in that atmosphere of slumber which makes it "always afternoon." Most striking, too, is the reflection that almost all these quiet hamlets can boast of antiquity far exceeding that of many of our large towns. This, at any rate, is the case with respect to villages lying between Newark and Bingham. Shelton, whose church is the subject of these notes, and Sibthorp, are good illustrations of the prevailing type of village in the district. The first-named possessed a church and a mill when Domesday Book was compiled, and the latter a priest. The mill at Shelton has long since disappeared, but a church still stands there, and a priest at Sibthorp still works on. Floreat Ecclesia! Though the round pillars, probably of Norman erection, remain within Shelton Church, the structure has evidently, by the testimony of the chancel and other windows, been restored in " Early English " days ; but there are curious relics which point to the existence of a Saxon, or at least " pre-Norman," edifice. On entering the porch the two curious small semi - engaged shafts ornamenting each side of the doorway demand attention. They have evidently been preserved and reinserted as relics of the primitive structure; they are of different design, and give a very quaint effect to the detail of the porch. The round pillars above alluded to support the roof on one side of the church only, the corresponding ones having been removed on reconstruction, and, if report be true, used to mend the roads. The base of the pillars is ornamented by a projecting tongue in relief, which radiates from the column upon the pedestal. The three windows, of " broad lancet" type, on the south side, have arches with peculiarly-broken lines, the shorter stones being cut almost straight, and giving a very irregular curve. The chief point of interest in this church is found in the remains of two curious sepulchral monuments removed from the churchyard—thanks to the care of the vicar (the Rev. R. W. Marriott)—and placed in the south corner of the nave, by the old piscina. These are thought by some antiquaries to belong to the ninth century. They consist of the lower portion of two oblong sepulchral chests, or sarcophagi, of elaborate workmanship. They are not strictly coped, but of a slightly rounded upper surface, and richly ornamented with an interlaced pattern. This consists of a band about 2 inches wide with a middle dividing line, which is, I believe, unusual. On one of these coffin-lids there is a central axial piece in relief consisting of what is obviously the lower portion of a cross, the upper part at the head being upon the missing half of the stone. The continuity of the band, representing unity, and the threefold triangle or triple oval, formed also by a triple band, are so palpably symbolic, that they contain with hardly a doubt an illustration of Christian doctrine in Saxon times. 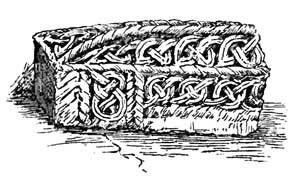 On the sides of this sarcophagus the undulating band will be seen to be entwined with circles, which form knots. These stones were disinterred under or near the present chancel wall, the chancel being probably longer in former days. The drawing is by Miss Banks Wright. The second coffin-lid (or shrine, as some may regard it) is more weathered, and seems older than the one just described. The interlacing is almost worn away, leaving a honeycombed surface. This reminded me of a curious perforation upon the stones forming the so-called "Giant's Grave" in Penrith churchyard. I now pass to a very curious and interesting relic in the form of an inscription, which has most likely been found in the foundations of the present church, or churchyard, and utilized, after being trimmed a little, by being built into the doorway of the north wall. It is about 2 feet from the ground on the left side of the doorway in the passage as you go to the vestry. 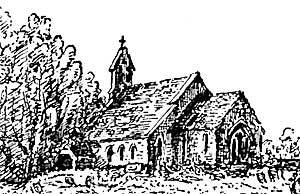 If the reader will refer to the Antiquary for July, 1891, he will find in the illustration to the article "Bygone Lincolnshire" a portion of an inscription upon a cross, built into the church of St. Oswald at Crowle. The characters in this inscription show some resemblance to the one at Shelton. The copy which accompanies this article is fairly accurate, but not quite so rude in style as the original. The stone being near the ground and vertically situated, it is not easy to obtain a satisfactory rubbing. Having seen a copy of this inscription which I forwarded to him, Mr. Walter de Grey Birch was of opinion that the words "Johm" for Johannem in the first line, and "p'sonam " for personam, a parson, in the third line, might be discerned The reader will notice that several of the characters are very like Hebrew, especially in the second line. It is evident enough that contractions are used. It seems equally plain that some of the letters are of Saxon date, as may be seen by a reference to Gough's Sepulchral Monuments. Possibly it was intended for a puzzle—originally. Some will probably read the first two words " Syr John," and family history may be involved in these irregular lines; but a puzzle, I suppose, they must now remain. My residence in the district having been but three weeks, I trust the local reader will pardon the brevity of my contribution to its ecclesiology. I must now take my leave for the present of this interesting old Nottinghamshire church, hoping at a future time to investigate further the antiquities of the district. 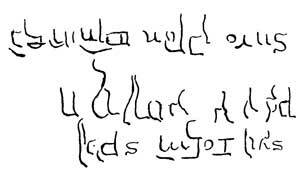 I will only add in conclusion, with respect to the above inscription, that several characters exactly similar to letters contained in it may be found in Gough's Sepulchral Monuments, taken from a ring which apparently belongs to the eighth or ninth century, and is undoubtedly Saxon.